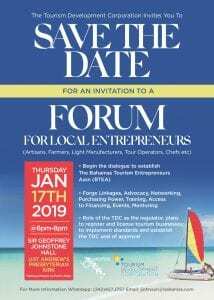 The Tourism Development Corporation will host a forum for local entrepreneurs on Thursday, January 17th from 6 pm – 8 pm at the Sir Geoffrey Johnstone Hall at the St. Andrew’s Presbyterian Kirk. The purpose of the event is to begin the dialogue to establish The Bahamas Tourism Entrepreneurs Association. For more information WhatsApp: (242) 427-3757.